The last time we tried to grow an herb garden, it ended terribly with a bunch of mummified plants covered in fruit flies. This is not an experience we would like to repeat. The Click & Grow helps people like us with black thumbs – or just those who travel away from home a lot – to grow houseplants without the trauma of forgetting to water them for a few days or weeks. 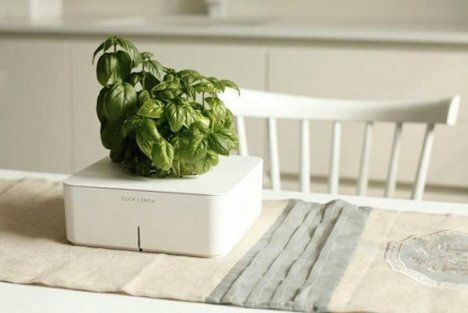 The Click & Grow is an electronic flower pot that takes care of plant care details like watering and fertilizing so you don’t have to worry about them. Each flower pot comes with a cartridge containing seeds, fertilizer and software. The user plugs the cartridge into the pot, supplies some batteries and a liter of water, then places the pot in a sunny place – and that’s it. The Click & Grow takes care of watering and fertilizing the plant to keep it healthy and happy. When your plant gets to the end of its life cycle and needs to be laid to rest, the cartridge easily comes out to be replaced by another.